Yesterday Rafael Correa, the President of Ecuador, used his Twitter account to take issue with a Guardian report written by Rory Carroll, based on an interview Carroll held with Correa. The report bore the headline ‘Rafael Correa: We Helped Snowden By Mistake.’ This headline was widely reproduced by other outlets on the basis of the Guardian report. However, Correa said, via his Twitter account, that Ecuador had never said it support for Snowden in his request for asylum had been a mistake. The headline was subsequently amended by the Guardian to ‘Ecuador says it blundered over Snowden travel document’. You can read the Guardian report here. Another objection raised by Correa on his Twitter feed was a mistranslation, where Correa was reported to have said that Snowden was a ‘complicated person’, when in fact Correa said that it was the situation that was complicated. Thus the overall effect of the Guardian report, the contents of which were widely distributed and commented on, was to misrepresent Ecuador’s position vis-à-vis Snowden: portraying Snowden as an unsympathetic character in the eyes of the Ecuadorean government, and portraying the Ecuadorean government as not knowing what it was doing in providing assistance to Snowden. 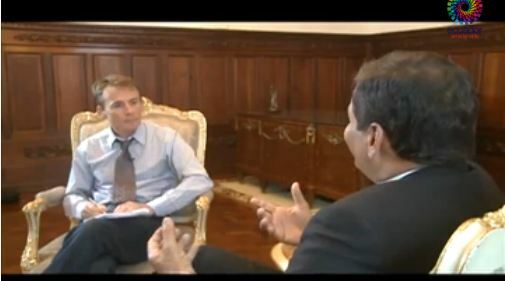 What follows is a translated excerpt of the interview posted above, from 06:55 onward, in which Correa outlines the position of the Ecuadorean government vis-à-vis Assange and Snowden. It was filmed and made public by the Ecuadorean government. At one point, Rory Carroll refers to the Communications Law being introduced in Ecuador. You may be interested in this analysis of the law’s content. RORY CARROLL: With respect to Mr Assange ..is it true that..
RORY CARROLL: Yes, I’d love one. Thanks. RORY CARROLL: Thanks. He (Assange) abused a little the confidence of the Ecuadorean government in this case? RAFAEL CORREA: Look, I don’t want to judge that. Those are crises, the despair of Mr Assange that Snowden was going to be captured etcetera.. suddenly he does it…he makes declarations that yes, we think were wrong, but we understand the situation perfectly and Mr Assange continues to enjoy our respect and of course, he is under the protection of the Ecuadorean state. RORY CARROLL: And your ambassador in the United States said, according to (inaudible) that there was the risk that Mr Assange was going to look like the spokesman for the government. RAFAEL CORREA: No, she didn’t say it, they stole one of her mails. And the message is true, in that she says Mr Assange looks like the government spokesman. And we said to Mr Assange to take more care in his declarations, because it’s true. I heard about the travel pass through Assange’s declarations. Look, the consul, he (Assange) is in the embassy, he’s a friend of the consul. He calls the consul at 4 in the morning saying they’re going to capture Snowden, the other one is distraught, how do we save the life of this man, and so on. So Assange finds out. But yes, I think that that was a mistaken action by Assange but it does not diminish in the slightest the respect that we have for Mr Assange and his asylum status and he is under the protection of the Ecuadorean state. RORY CARROLL: Given those circumstances, are you going to sanction the consul? 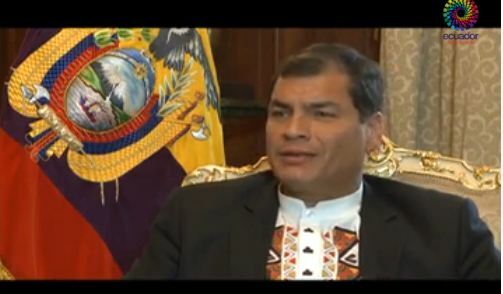 RAFAEL CORREA: That will be the decision of the government in due course, of the Foreign Ministry. RORY CARROLL: And if.. with regard to snitches* is it not true that according to the Communications Law, snitches in Ecuador could be pursued by the government here? RORY CARROLL: Section 30, for example. That which is expressly protected under a reserve clause previously established in law; information regarding personal data and that which comes from personal communications (to Carroll) that is, protecting privacy (reads) information produced by the Public Prosecutor..the law holds that prosecutorial investigations are confidential, information regarding boys, girls and adolescents that violates their rights as established by the Code of Childhood and Adolescence. What is the problem with this article? RAFAEL CORREA: Surely in Great Britain, surely in China, in Sweden, every country has restricted information. We have never said that revealing information is permitted. And the consequences would have to be assumed according to the law. What we have said is that what he has revealed, if a person reveals something that is confidential information, he probably damages the country, but let him say that what we are doing is something illegitimate. Here the core of the matter is that Mr Snowden has revealed something illegitimate. Something that attacks the human rights of the North American people and the sovereignty of states. Because the North American people have been spied upon and states have been spied upon. So it is not that we are justifying the law being broken and things getting out, no-one has said that. It is perfectly legitimate for any state, even in defence of privacy, of childhood or adolescence, to have restricted information. But the panorama changes completely -someone robs secret information from the Ecuadorean State, just to make money, and he says where the radar stations and defence sites are etcetera, well of course the full weight of the law has to be applied. But it is something else if you divulge something illegal that the government is doing, and you haven’t done so to make money but as Mr Snowden has said, out of his conscience, as a contribution to society and the world. It changes the circumstances completely. That is what we are arguing. We are not..we have never said that restricted information can be divulged. We have not even said so in the case of Assange, so look through all the notes and all my declarations. RORY CARROLL: In your opinion, could Mr Snowden be a martyr? RAFAEL CORREA: I don’t want to be putting forward criteria. But I insist: it is not the same as someone divulging a country’s confidential information when that information is legal and legitimate in relation to legal and legitimate actions and to receive money to enrich oneself. We would never even receive a letter from that person. It is another thing for someone without any desire to enrich themselves to divulge information, breaking the law of his country, but information on illegitimate and illegal acts of the North Americans, spying on their own people, spying on sovereign states. I believe a situation of that nature at least deserves consideration, in a request for asylum. They are two different things. Here, they can divulge what they want. They will break the law, due process will apply, but I assure that never will they be able to divulge illegal actions in our government. Because they do not exist. RORY CARROLL: In your heart Mr President, do you think Mr Snowden one day will manage to come here? RAFAEL CORREA: It’s very complex, Mr Snowden’s situation. But at the moment he is in Russian territory. So those are decisions that the Russian authorities have to take. RORY CARROLL: But in your opinion, would you like to meet him? RAFAEL CORREA: Not particularly. It’s a very complicated situation. Strictly speaking Mr Snowden has also spied for a period of time. At any rate we are always going to be very concerned with due process, human rights, not only of Mr Snowden but of any citizen. RORY CARROLL: And what would you say to him, if, for example, he was here with us, or what message would you like to send to him? RAFAEL CORREA: Look, I would like to speak about objective things, in accord with the law, the constitution, what the country is doing. Not subjective things, not about what is happening with me, whether I like him or don’t like him. I don’t know Mr Snowden. And with Mr Assange, the only time I spoke to him was when he interviewed me on Russia Today. Translated excerpt ends at 13:35. *The word Rory Carroll uses here is soplón, which is a pejorative term closer to ‘snitch’ or ‘grass’ than ‘whistleblower’.